» MBA Article Guide » Is the Value of a MBA Degree Worth It? Investing in the future by pursuing an MBA isn’t a decision that today’s prospects can take lightly. The associated costs of Business school and the time spent in the classroom instead of in the workforce are strong factors that many candidates are considering before choosing to embark on an MBA. GMAC’s 2015 Prospective Survey reports that nearly half of respondents considering a business school education were hesitant about taking on a large financial debt. Still, there is significant evidence that an MBA education is a game changing tool in terms of opening doors, financial rewards and ongoing success. In spite of fears that time spent out of the workforce, or in a limited capacity during school might have an inhibiting effect on career mobility, the opposite seems to be true. A survey of 2015’s graduating class showed that MBA grads had success leveraging their internships and work projects into job offers 50% of the time. In fact, more than half of 2015s job-seeking business school graduates received early job offers prior to graduation – nearly 7 in 10 for domestic students. 18% of the offers extended to 2015’s graduating MBA’s were for senior level positions. 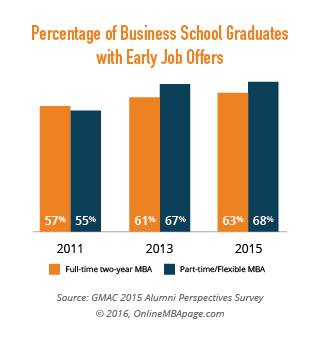 Nearly 9 in 10 of 2015’s graduates felt that their MBA education improved their ability to find a job that met their expectations. While the cost of an MBA can create a lot of apprehension for prospective students, the overwhelming evidence from 2015’s graduates suggests that it’s not only possible to find a better job, but that the financial opportunities are much richer. Of 12,000 business school alumni polled in 2015, 90% felt that their education increased their earnings power. 79% even felt that they were competitively paid. Perhaps even more compelling is that post-degree salaries for 2015’s graduating MBA’s globally are 90% higher than their pre-degree salaries.While the initial financial burden represented by investing in an MBA may seem significant at the outset, the positive financial outcomes for MBA graduates make it appear a solid investment strategy. Point of fact – an MBA graduate more than double the spending power of the average person in most places. While over half of prospective MBA students considered studying abroad, the data suggests many hurdles for international students seeking to work in the country they attended school in. Just 1 in 4 international students had job offers before graduation in 2015 compared to 70% of domestic grads. This number is on the rise over previous years, but there are other factors to consider. Alumni working in entry-level positions after graduation were more likely than other alumni to be working outside of their country of citizenship. The Alumni report shows that just 12% of the existing MBA workforce represented are self employed. Only 5% of the 2015 graduating class has entrepreneurial ambitions, and that’s a growing number. Traditionally the role of graduate management education has been to facilitate career growth and spawn success in corporate settings. While it could be inferred from the numbers that more people end up self-employed than perhaps intended to, the Alumni career success index comparing employees to self-employed business school alums has some good news. Asked to rate their career success, self employed MBAs tended to be slightly more likely to rate their careers as successful or extremely successful. Even if 12% of the current graduating class ends up working for themselves over the next few years, the numbers indicate that success will likely follow. The low reported number of self-employed MBAs overall, coupled with only 5% of 2015s graduates planning to enter the self-employed workforce make it seem as if the vast majority of graduate management students are seeking corporate career tracks, and that were true as recently as 2010. Perhaps in the past there was an aversion amongst bootstrap innovators and entrepreneurs towards a formalized education, but this segment is growing fast. In part due to the emergence of worldwide markets in the wake of digital globalization there has come a burst of growth not only in the business development sector, but in entrepreneurs seeking the advantages that come with a business school education. Rather than hiring out of business school, many aspiring capitalists and titans of industry are joining the ranks of business school students and filling classrooms more than ever before. While Only 1 in 10 prospective graduate school students seeking to work for themselves is currently self-employed, 28% of them are looking to start their own business. In emerging markets like Africa and South Asia that number is nearly doubled. Not content to rely on others for deep analysis and strategy, entrepreneurial business school candidates are hungry for any advantage. Their competitors C-suite offices are filled with some of the best and brightest analytical minds ever honed in graduate management school. The KSAs (knowledges, skills & abilities), networking opportunities, and hands-on experience one acquires in business school are tools that the leaders of the fortune 500 have access to. Their upstart counterparts have latched onto that and are beginning to understand that they can leverage those same tools to even the field. Millennials represented 88% of the prospective student demographic surveyed. They applied to graduate school on average within 8 months of receiving their first university degree. The other two demographic segments (Gen X & Baby Boomers) averaged a time span of 12 years since graduation before pursuing business school. While all three segments strongly desired career enhancement and job opportunities, Millennials favored increased earning potential more than their counterparts. The flannel clad cohort shared with them a desire to hone business KSAs , but their overall desires seemed to be balanced out between the extremes of the younger and older generations. Their parents generation on the other hand were 10% more likely to be heavily concerned with remaining competitive, but were almost 20% less likely than millennials to be motivated by accelerating their career or developing managerial skills. The oldest potential students were least interested in an international education. Gen X is too cool to care about gaining respect or recognition, and the Millennials are more interested in almost everything, except when the old people are really into it. While nearly 70% of the Boomers were interested in personal satisfaction as an MBA goal, just half of the new kids cared whether they were happy as long as they were wealthy and skillful. Those differences carry over across the board in 2015 as prospective students aren’t just seeking different benefits, but experiences. Ostensibly, higher full-time employment rates drive the older groups towards programs geared for working professionals with flexible scheduling and online classes. Despite being technically savvy, the Millennials surveyed were looking for less than 20% of their material to be delivered online, compared to 33% among the baby boomers. For older students seeking a one year full-time MBA program that statistic increases to nearly half. Both older generations sought programs with smaller classes and a casual environment, whereas younger students sought out larger class sizes with a competitive, team oriented format and and a more formal environment. Beth Flye, Director of Admissions at MBA@UNC, provides an overview of what it really means to pursue an online MBA education. Beth discusses: the common myths around online education; the type of candidates who are right for online MBAs; the quality of education; and many other issues. UNC is featured in our America’s Best Online MBA rankings for 2017 report. There are many anecdotal tales of squandered educations – “I never used my degree in the real world” is something you might hear in casual conversation with a college graduate, and it’s true. Many career paths don’t require a basic understanding of cell division, Pythagoras or the Gettysburg Address. While that may ring true for some education paths, even at the graduate level, the value of an graduate management education is implicit in the ringing endorsement of the alumni – 95% rated their education as a good to outstanding value, and 93% would recommend such a program to others. More than 8 in 10 alumni say they use those KSAs they learned in business school every day. Aside from greater financial and career opportunities, there are a diverse array of reasons that people are choosing to pursue an MBA in 2015. MBA graduates experience high levels of career satisfaction and personal freedom in directing their aspirations. More than 4 in 5 MBA program alumni say that their education contributed to their productivity, creativity, autonomy, and risk tolerance. 84% of business school alumni said that their education improved their job satisfaction. Based on the 2015 alumni data, within 5 years of graduation most MBA graduates are in senior level or higher positions within their companies and the trajectory for career growth is stable. The value of an MBA in 2015 and beyond makes sense for many students who are oriented on becoming better decision makers and risk takers and innovators. The MBA path creates opportunity in the form of economic and career incentives and helps to develop invaluable relationships and experiences. The overall success and career satisfaction rates for business school graduates and alumni make a compelling case for business school as a solid foundation for strong career prospects.